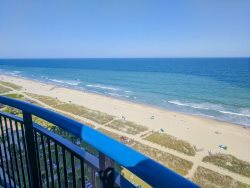 Oceanfront 2 Bedroom, 3 Bath suite at Boardwalk - sleeps 10! If you're looking for the perfect vacation rental, the search ends here. This recently updated studio sits on the 5th floor of the Palace Resort and offers an amazing Northern view of the Atlantic ocean. It comfortably sleeps 4 with one queen bed and a queen sleeper sofa. Feel free to pack light as this condo is equipped with all necessary supplies such as toiletries, linens, pillows, quilts, towels, dishes, cookware, utensils, silverware, coffee pot, toaster and more! The new appliances and updated cabinets compliment the tile backsplash tremendously. Our guests will enjoy a beautifully decorated studio with new furniture! This is truly an incredible rental that boasts endless views of the ocean, and our guests love staying here. Please note: The Palace Resort is currently completing an exterior project that will take place until the end of April 2019. Our balcony is not complete and you will not have access to it and there could be noise and odors that affect your stay. Pools and amenities may also be affected. If given advance notice, we may be able to give you pool access to another place. We apologize for any inconvenience but because you are being forewarned, there will be no refunds given. Our prices are already discounted due to this. This place was awesome! Updated, clean, and centrally located! It had everything we needed! Cant say enough nice things about the Plalace Resort also! All staff were very nice, friendly, and helpful! The grounds and facilities were kept very nice! Please Note: The Palace Resort is currently completing an exterior project that will take place until the end of March 2019. Our balcony is not complete and you will not have access to it and there could be noise and odors that affect your stay. Pools and amenities may also be affected. If given advance notice, we may be able to give you pool access to another place. We apologize for any inconvenience but because you are being forewarned, there will be no refunds given. Our prices are already discounted due to this.